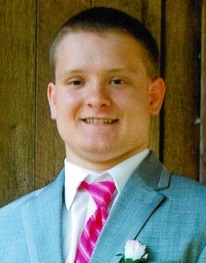 Clay Alan Atkins, 21, passed away Saturday, April 6, 2019 due to an automobile accident. He was born in Jasper, March 12, 1998 son of Frank and Amanda (Jones) Atkins. Clay was a 2016 graduate of Perry Central High School where he played football during his high school years. He was presently in his third year at University of Southern Indiana where he was majoring in mechanical engineering. During the past three summers, Clay had worked at Waupaca. He enjoyed hunting, fishing, boating on Lake Patoka and working on about anything along side his dad and brother and spending time with friends and family. He is survived by his parents; Frank and Amanda Atkins, Leopold; brother, Cody Atkins (Aquaila), Tell City; aunts, Abbie Brown, Gatchel, Chris Barnett (Tim), Holland and Kathy Blake (Jeremy), Bristow; uncles, Marshall Jones, Gatchel and Marty Jones (Misty), Tell City; grandparents, Marshall Jones, Sr., Gatchel, Linda Atkins, Birdseye and Kenneth Atkins, Rockdale, TX; foster niece, Anna and several cousins. Clay was preceded in death by his grandmother, Mary (Taylor) Jones. Funeral services will be at 11:00 AM CDT Wednesday April 10, 2019 at Huber Funeral Home, Tell City Chapel with burial in Lilly Dale Cemetery. Bro. Eddie Olberding will officiate. Visitation will be from 2:00 until 7:00 PM Tuesday and from 9:00 until 11:00 AM on Wednesday. Memorial contributions may be made to Perry Central Athletic Department.